The demand for lemons increases by leaps and bounds as the mercury rises. In Italy, Sicily, Corsica, and other parts of southern Europe, particularly in Spain and Portugal, lemon culture has been a large commercial industry for many years. The lemon is a close relative of the orange and has followed it all over the world. The straggling branches of the lemon tree, however, are very unlike the compact dense foliage of the orange, and the purplish flowers have not the agreeable fragrance of the white orange blossoms. 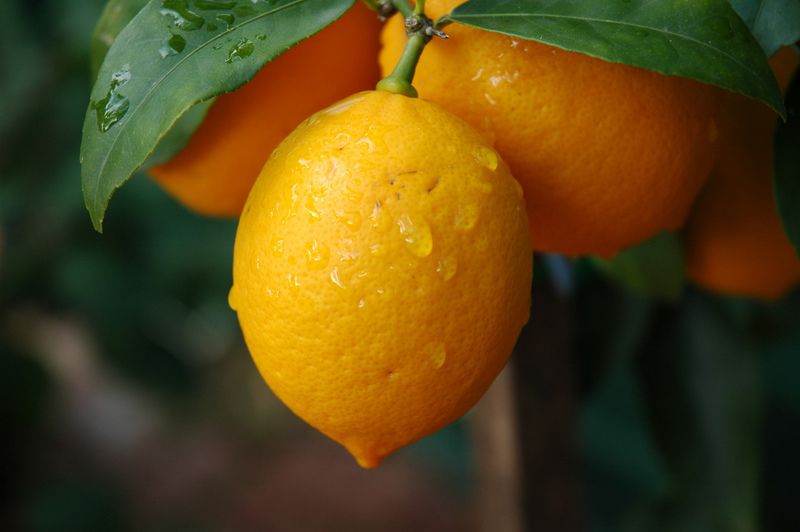 The lemon is much less hardy than the orange and the area of cultivation is more restricted. It is cultivated and propagated in much the same manner as is its near kinsman the orange. If lemons ripen on the trees they lose their keeping quality, and so they are picked green, before there is any sign of the golden yellow colouring. Each picker has a little ring 2¼ inches in diameter, and the fruit is cut when it can just slip through the ring. From the moment the lemons are harvested they must be handled as carefully as eggs. In dark storehouses, well ventilated but free from draughts, they are spread out and slowly ripened. In curing, the fruit shrinks a little, the skin becomes thinner and tougher and develops a silky finish. When the process is completed the lemons are washed, dried, and wrapped in tissue paper. In this condition they will keep for months, which is a very good thing for the growers, as most of the fruit ripens in the winter and the great market demand is in the summer. The lemon is used in more different ways than any other of the citrus fruits. From the rind, lemon oil or extract, used in flavouring and perfumery-making, is obtained either by expression or distillation, and candied lemon peel is made. The pulp yields citrate of lime, citric acid, and lemon juice. Besides its use in flavouring foods and drinks of various kinds, lemon juice is much used by calico printers to produce greater clearness in the white parts of patterns dyed with dyes containing iron. Scientific name Citrus limonia, the lemon tree is exceedingly fruitful.